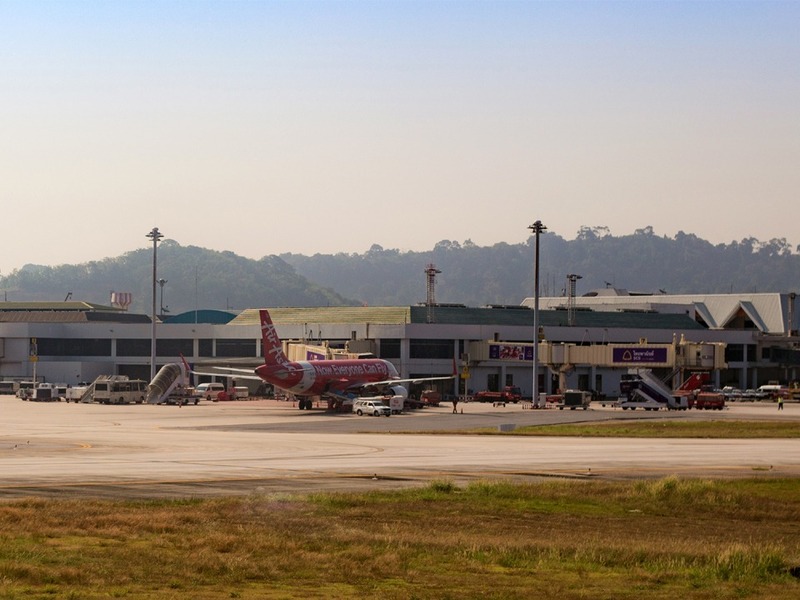 Phuket International Airport, the third busiest airport in Thailand after the two Bangkok airports, is located about 32 kilometres north of Phuket City and 36 kilometres north of Patong Beach. It's Phuket's only airport, handling both domestic and international flights as well as cargo. 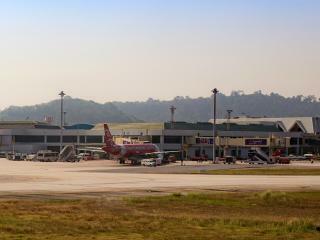 In 2012 Phuket's airport handled 9.5 million passengers. 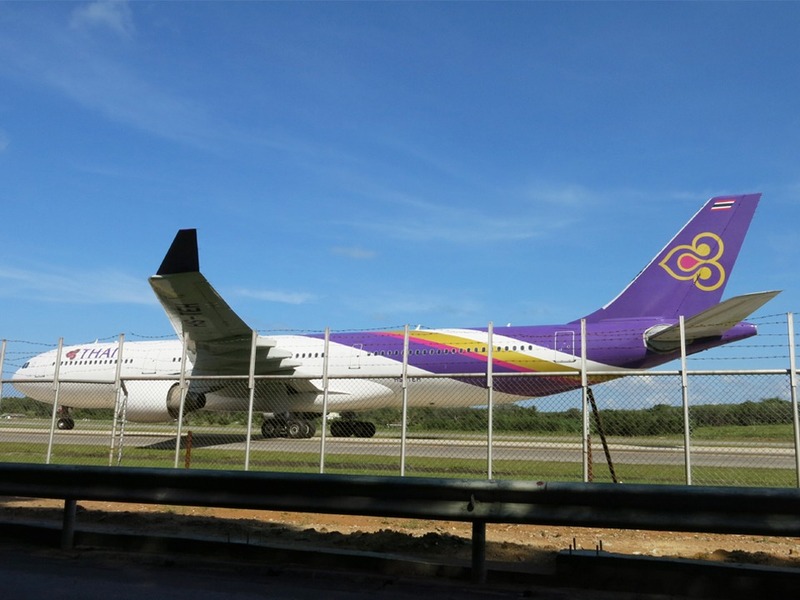 The airport handles direct scheduled flights from Bangkok, Singapore, Malaysia, Hong Kong and Australia as well as long haul international flights from a number of charter operators as well as scheduled airlines. 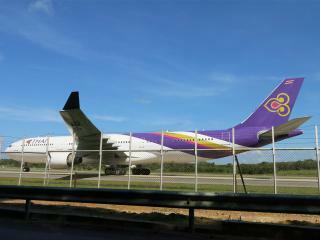 There are also excellent air links direct from Phuket to many other cities in Thailand and Asia. 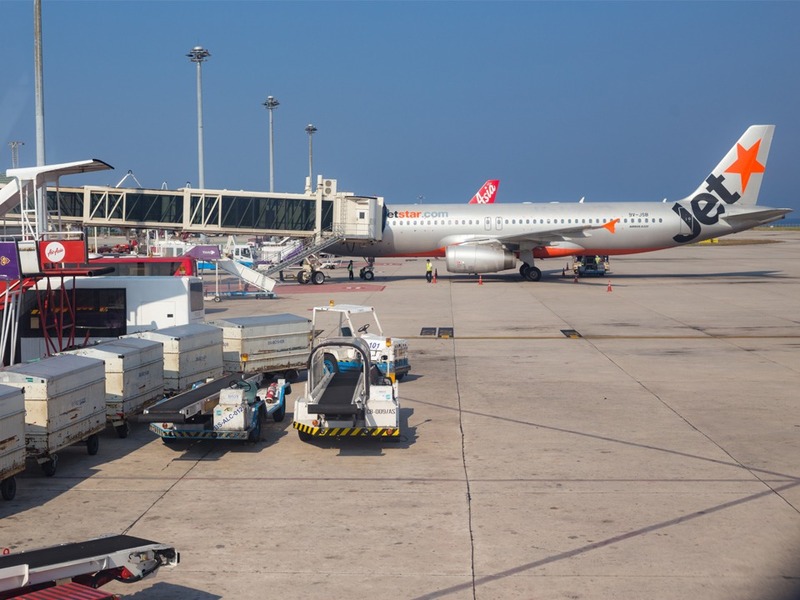 Due to record-setting passenger numbers, the airport is currently undergoing a 5.8 Baht billion expansion and renovation which will last until 2015. The expansion plans include a new international terminal, refurbishment of the existing terminal for domestic use, and other improvements. Most long haul international tourists fly to Phuket via Bangkok, Singapore or Kuala Lumpur, although this may not be immediately apparent from your ticket and more scheduled airlines are now flying direct to Phuket.. Your best bet for getting to your hotel is to pre-book an airport transfer when reserving your accommodation. This may already be included by your tour operator - check it out. If you''ve arranged this, you'll find someone waiting just outside the arrivals hall with your name on a placard; take your time and look carefully - it can be crowded and a bit chaotic! If you haven't booked a transfer, you have several options: airport limousine, public bus, minibus and airport meter taxi. The meter taxis charge an 'airport surcharge'+ what's on the meter; you may have to walk out into the car park to find the meter taxi rank. Limousines are more expensive, but less hassle; if you choose this option, go straight to the limousine booking desk inside the arrivals hall. For passengers arriving at and departing from Phuket International Airport, there is a private airport bus service on Phuket Island that offers an alternative to public buses, 'limousines' and taxis, the Phuket Airport Bus Express. travels between the airport and Kata, Karon, Patong and destinations in between. Buses depart from the airport every hour or when full from 8am to 8pm. Passengers going to the airport are asked to call 076 328291 or 084 065 2122 and state their required pickup place and time. Buses are the cheapest option of reaching your destination although they may not be the quickest. Finally, minibuses - a join-in option with others - are cheaper but less reliable. The driver may stop off at various hotel booking 'agents'' along the route and try to get you to change your hotel booking! Unless you're on a really tight budget, we recommend you avoid the minibuses and start your holiday in style. Whichever option you choose, don't be tempted by the touts outside the arrivals hall shouting 'taxi' from all directions. Their vehicles are usually unlicensed and uninsured. Depending on where you're staying, your transfer can take up to one hour +. You can start your holiday in style by booking a helicopter island transfer. A number of helicopter operators work very closely with all the luxurious Resorts in Krabi, Koh Lanta, Koh Racha, and Koh Phi Phi to provide you with a safe and efficient helicopter transfer. The same companies also provide tours of the islands and Phang Nga Bay by helicopter with some stunningly beautiful photo opportunities. As hiring your own car is the very best way to see Phuket, you may want to avoid the airport transfer hassles and drive yourself. All the main international and island car hire companies are represented in the arrivals hall. If you've pre-booked, just look for your company's logo on one of the desks. If you do decide to drive yourself, check out your route beforehand and make sure you've got the hotel phone number handy. Locally available maps are OK, but as yet there is no truly detailed map of Phuket available, while asking locals for directions can be more than a little frustrating; ask three people and you'll probably get three different directions! If you get lost, find out where you are and call the hotel. You need an international driving licence to drive in Thailand. Phuket Airport is fairly small and unsophisticated. When you get into the departure hall, look for the check-in desk(s) with your flight details on a sign above it/them. Once you've checked in you are free to go through customs and immigration, but if you plan on eating before your flight hold on... Once through passport control, you'll find only light snacks, tea, coffee and maybe beer. In the departure hall, there's a pub with a limited menu on the same level and an Thai and international restaurant on the floor above. Neither is recommended for a great meal, but if you've got time to kill and an appetite or a thirst, they'll do. Make sure you allow plenty of time to go through immigration. The lines can be long and slow-moving. There's also very limited shopping at Phuket Airport so - if you're transiting en-route back home - you're advised to do your duty free shopping at your transit stop. Basic duty free goods (cigarettes, alcohol etc) are available. 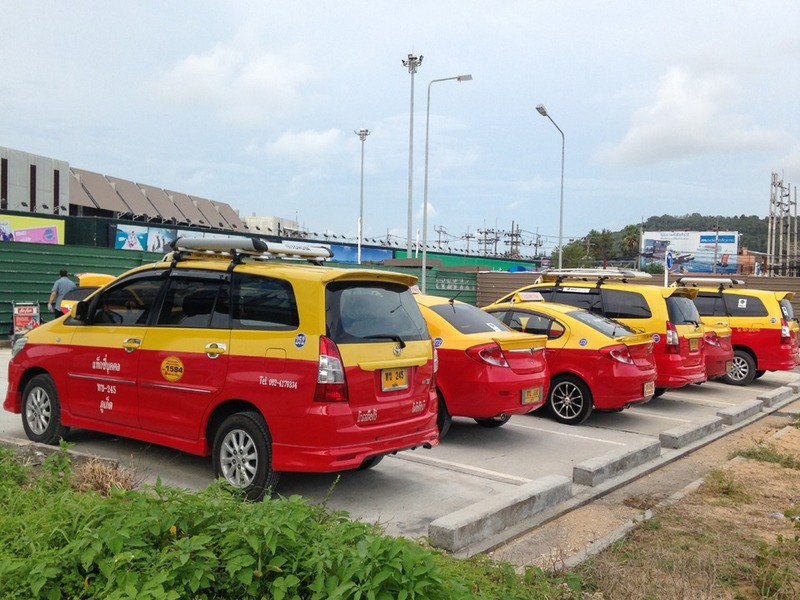 For passengers arriving at and departing from Phuket International Airport, there is a private airport bus service on Phuket Island that offers an alternative to public buses, ‘limousines’ and taxis. 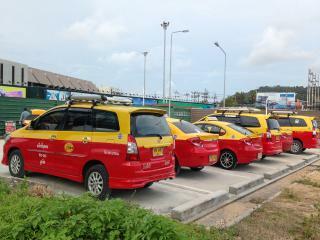 The Phuket Airport Bus Express travels between the airport and Kata, Karon, Patong and destinations in between. Drop-off locations include the Airport, Muangmai, Thalang, Heroines Monument, Boat Lagoon, Tesco-Lotus (bypass road), the See Kor Intersection (near the Caltex petrol station) in Kathu and at Jungceylon in Patong (bus stops on Phang Muang Sai Kor Road). Bus drivers will drop passengers off at their hotel if possible. Buses depart from the airport every hour or when full from 8am to 8pm. Passengers going to the airport are asked to call 076 328291 or 084 065 2122 and state their required pickup place and time. The minimal fees vary between destinations and tickets can be bought from the driver. Airline phone extensions: The individual airline extensions are available on the airport website. Airport Code: Phuket airport IATA code is HKT. Location: 32 kilometres from Phuket City and 36 kilometres from Patong Beach. Capacity: The airport has a capacity of handling 24 flight operations per hour.